There nothing like the smooth, gentle motion of a nursery glider or rocking chair to help you rock your baby to sleep. They’re also a comfortable place to cuddle, feed, and read to a child. Today’s nursery gliders and rockers come in a variety of styles, from traditional to sleek and modern. They are available in plenty of color and upholstery options to choose from, so they’re sure to meet your rock-a-bye needs and fit with your home decor. 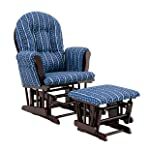 If you’re looking for a nursery glider or rocking chair for sale online, this article is for you. This article is a guide to helping you choose the best glider or rocking chair for your baby’s nursery, showing all the important aspects you’ll want to consider before making a purchase. Even though nursery gliders and rocking chairs both provide stylish seats, they have significant differences. Rockers and gliders vary in their construction methods, which directly affects the type of movement and comfort level each chair offers. A glider slides back and forth in a smooth horizontal motion, while a rocker sways back and forth in a stronger movement. Gliders tend to offer a smoother ride; plus, they’re designed not to trap toes underneath as a rocker can. When it comes to the comfort level, the gliding chair is likely to win you over. Some modern nursery gliders even feature springs underneath the seat cushion to increase the degree of comfort. Many nursery gliders also come with a small matching ottoman where you can rest your legs and feet. For most people, the best nursery glider is definitely comfortable. If you think it’s wrong, try spending half the night feeding a fussy baby in an uncomfortable chair. 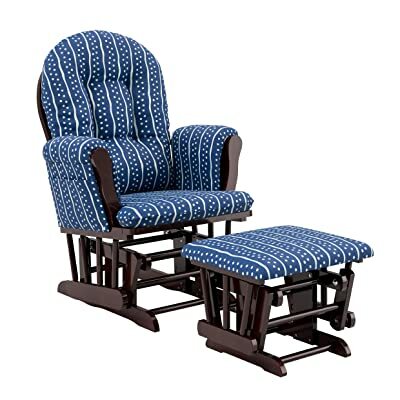 Your glider or rocker should give you room to change position easily, be the right size for your body, and provide sufficient neck and back support. You’ll want your feet to reach the floor at an angle that feels good, or you’ll want a nursery glider that comes with a matching ottoman. When you sit for long periods, this ottoman can help to prevent swelling, as they raise your feet closer to your heart. 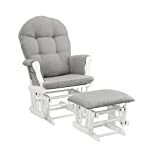 Also, your nursery glider or rocker should have wide seat and wide padded armrests. Whether you’re breastfeeding or soothing baby, you’ll want some extra room to move around and get comfortable. This is especially true if you’re nursing, since you’ll probably try a variety of positions before settling on the one or two that feel best for you and baby. Many gliders have built-in locks to keep them from moving back and forth, such as the Dutailier Sleigh Glider-Multiposition, which prevents the chair from moving when you don’t want it to. This really comes in handy when you’re hoisting your sleep-deprived self and a sleeping baby out of the seat. It also avoids hurt fingers and toes once your little one becomes an active, curious toddler. Rockers can easily move to face whatever direction you prefer, while gliders are heavier and harder to adjust. If you want a glider but think you’ll want to change its positioning, consider a model with a 360-degree swivel. Some gliders and rockers recline for greater comfort, which can come in particularly handy when you’re comforting a sick child. No matter what you choose, rocking your baby is a timeless act of motherhood that should be cherished. Holding onto a baby as they drift off to sleep in your arms is one of the first joys of motherhood, and you just may experience it in the chair that you choose! Here are our top picks of the best gliders and rocking chairs for baby’s nursery on the market today that sure will be causing pleasure for both you and baby! When it comes to adding a seat to your nursery, often a glider like this is a great option, as it offers a soothing rocking motion for both you and your little one. Crafted from a solid rubberwood frame with a 2.5” thick foam filled cushion upholstered in polyester, this glider is sure to give you the space to lean back. With the included ottoman, you can also put your feet up as you rock. With a variety of styles and colors available, you can easily opt for the model that fits your room decor. And most importantly, at a very affordable price – one of the cheapest nursery gliders on the market – this is our pick as the best nursery glider for most people. Unfortunately, this affordable nursery glider chair is very comfortable to sit in, but it doesn’t allow to lock the seat from rocking. And this chair is built for average people, so if you’re very tall or big, this is not for you. Dutailier is a privately owned Canadian company established nearly 30 years ago. The company began as a manufacturer of wood components and furniture, including a limited number of nursery glider rocker models. In 1988, Dutailier began focusing all research and resources into becoming the premier producer of nursery gliders and rockers. It succeeded by bringing the finest technology, superior quality and durability, and patented mechanisms to its furniture. If there is extra room in the budget, or if you’re looking for the best quality nursery glider, this Dutailier’s Sleigh glider and ottoman just may be what you’re looking for. This Sleigh nursery glider and matching ottoman offer an exceptionally smooth and extra-long gliding motion with thick cushions and padded arms. 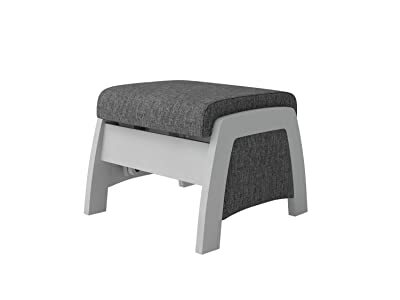 With an additional, angled flip-out footrest, the nursing ottoman makes it possible for you to lift your knees, perfectly propping up your lap and bringing the baby in close. When no longer needed, the footrest can be discreetly tucked away. The patented multi-position mechanism locks the glider into 6 different positions and makes it easier to sit in or step out of the glider. In addition, this ergonomic design features a reclining option to maximize your comfort level and offers unlimited positions to choose from along with its capability to glide while in the reclined position. Its contemporary design married with a luxurious wood frame and soft to the touch cashmere-like fabric will add value to any room in your home and foster many memories. Built with safety in mind, this nursery glider exceeds all safety standards, has no sharp edges, and features non-toxic finish. The Dutailier’s Sleigh glider with ottoman is also one of the best nursery gliders for big and tall parents as it has spacious seating room (42.5” H x 27” W x 31” D) with high back and ultra-durable solid wood construction. Great reclining mechanism allows the backrest to be fully adjustable. DaVinci is one of the most trusted manufacturers of baby and children’s furniture. Its styles and fashions are the perfect touches for a baby’s nursery. DaVinci products have a sleek, contemporary appeal and are known for their quality, durability and great selection of color and finish options! The DaVinci Maya Swivel Glider and Ottoman Set is one of the most comfortable glider chairs for your nursery as it’s designed to provide hours of comfort for you and your little one. Gliding motion and 360-degree swivel, this chair gives you freedom of movement while gently rocking your baby. 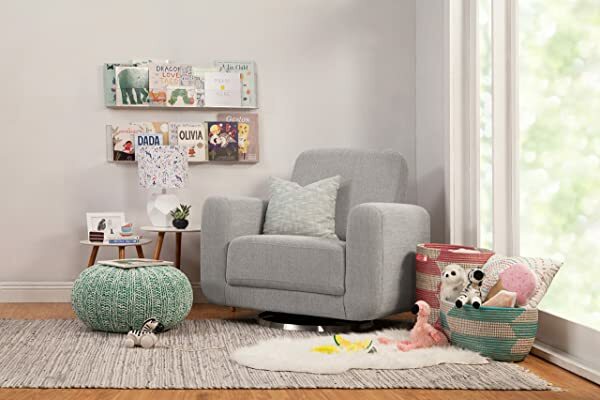 Featuring ultra comfortable pillow back cushioning and armrests, 100% soft and durable upholstered polyester fabric with high resiliency foam, this swivel glider is a perfect spot to rock baby to sleep, catch up on some reading, or steal a quick break from the day. If you like to soothe your baby on a traditional rocking chair, the Graco Harper Tufted Rocker is a perfect chair. The gentle rocking motion of the rocking chair will provide a relaxing experience for you and your baby. The soft upholstery fabric can be spot-cleaned with a damp cloth making cleaning up after spills easy. Plush polyester cushions and padded armrests combined with a solid hardwood frame provide exceptional comfort. 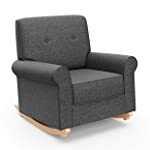 This nursery rocker comes with removable rocker legs that convert into a traditional armchair. The contrasting natural rustic legs are switched with the solid wood pyramid feet in a few easy steps. The Graco Harper Tufted Rocker is available in Oatmeal, Horizon Gray, and Night Sky colors, making it easy to match with any décor. This swivel glider is super comfortable and its extra wide 26” seat, plus with high back and large arms, are ideal for those who have twin babies. This chair is wider than most nursery glider and rocking chairs we’re reviewing – exactly one and a half times wider than a standard glider – making it easier & more comfortable for you in feeding your twins simultaneously. The Babyletto Tuba swivel glider is built to quietly swivel 360-degrees and glide back and forth in order to create a calming environment for you to bond with your baby. The chair is made of a polyester-polyfiber weave and stainless steel swivel base. 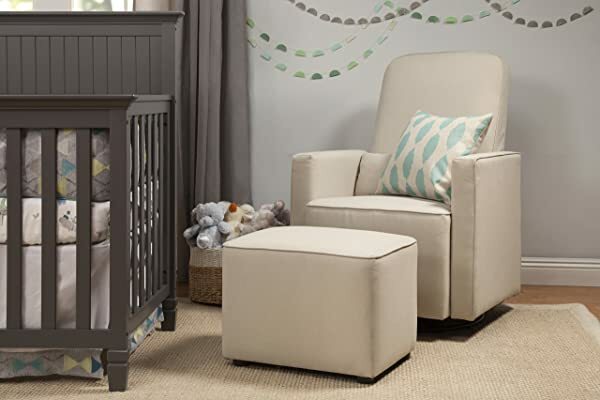 Perfectly paired with this nursery glider is the Babyletto Tuba Swivel Gliding Ottoman. 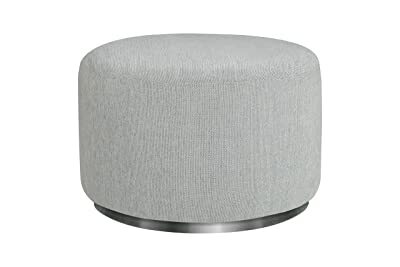 This ottoman is also able to swivel 360-degree and glide back and forth on a sleek, stainless steel base. 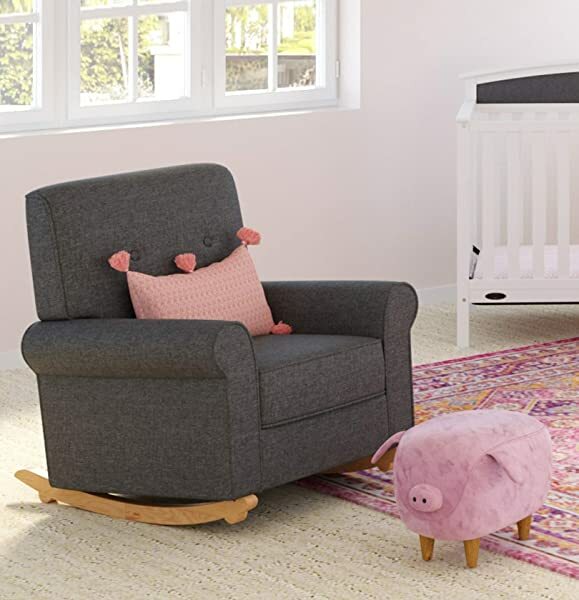 With its curved back and rounded design, the Babyletto Madison Swivel Glider doesn’t take up too much space in a room so it is one of the best nursery gliders to buy if you only have a small space or if you’re shopping for the bedroom. This small swivel glider chair is upholstered by hand in ultra-soft water-repellant and stain-resistant microsuede. The circular back is hand-crafted, and the glider rests stably on a robust metal base. Its attractive mid-century modern design adds beautiful comfort not only to the nursery but to any room in the house. Featuring lower back support, the Storkcraft Shoreline Hoop Glider and Ottoman provides a comfortable seat for moms who have lower back pain. With padded armrests and large side pockets for convenient storage, these soft polyester cushions can be easily spot-cleaned when challenged with accidental leaks and spills. The Storkcraft Shoreline is constructed with sustainable rubberwood (hardwood) and composites with enclosed metal ball bearings for the smooth gliding motion. Founded in 1945, Storkcraft has grown from a local artisan producing high-quality, innovative cribs at a single location to a global entity. 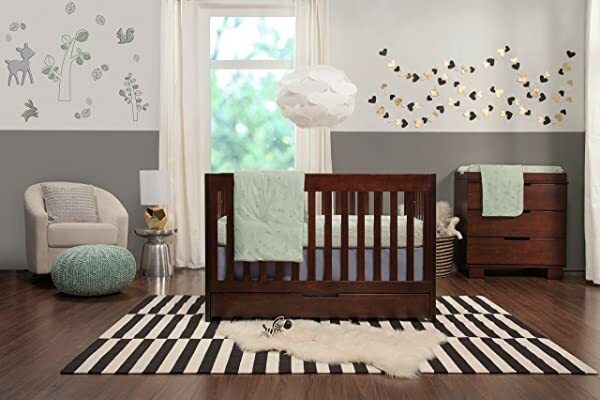 The company also manufactures products for the total infant or kid’s bedroom solution, including changing tables, dressers, glider rocker chairs, mattresses, beds, and bunk beds. Stork Craft has made a name for itself by producing quality, affordable products for families worldwide. This set includes upholstered ottoman with removable bin top offers extra hidden storage. 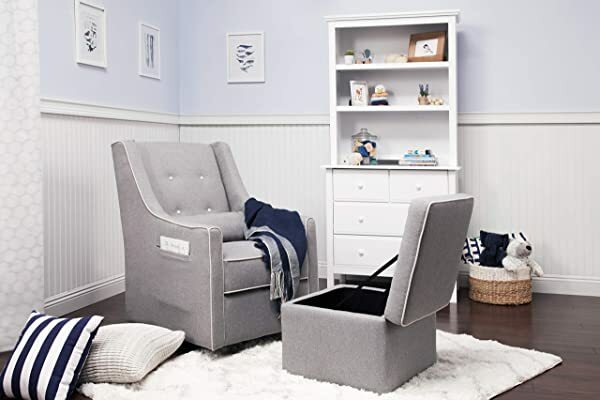 This storage ottoman helps hide baby toys, books, and other essentials but still keeps them close at hand. 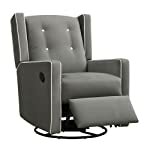 The glider chair features streamlined piping and button tufting for a cushioned back surface through every feeding. High back with lumbar pillow included for extra lower back support. Metal base allows for a smooth and gentle 360-degree swivel motion and forward and backward gliding. 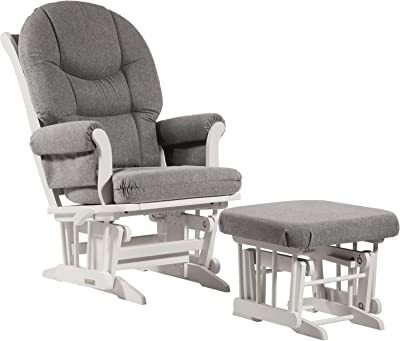 Featuring convenient swiveling, soothing gliding and deep reclining functions, this 3-in-1 nursery glider chair covers all that you need for a nursery glider. The enclosed ball bearing mechanism allows for both a rotating swivel function and a smooth gliding motion, giving you a full range of movement and convenience. For even more comfort, a built-in easy-pull mechanism is within reach to prop up your legs on the leg rest or to fully recline the unit. Its reclining mechanism is hidden and thoughtfully within easy reach. 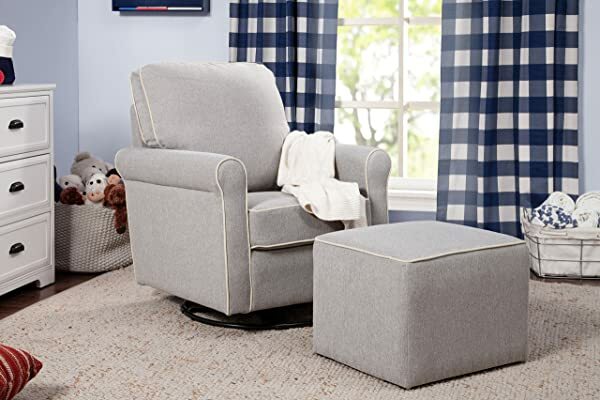 With so many comfort features for customizable your positions, this swivel recliner glider will surely provide you the most comfortable seat, let’s you and your baby get the rest you crave. 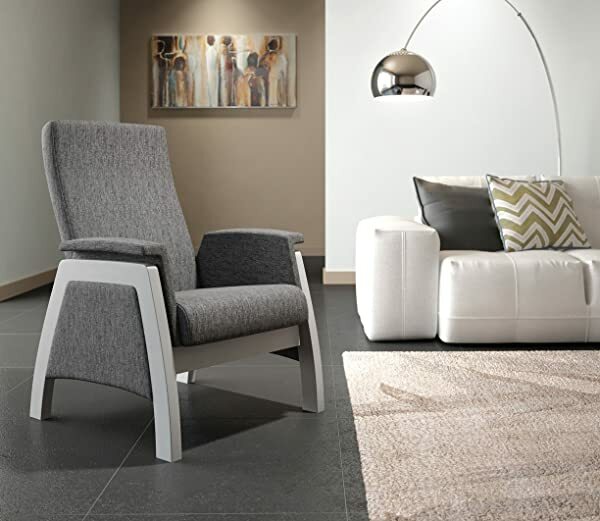 For looks, this chair is wrapped in polyester blend upholstery complete with white buttons and piping for contrast. The reclining mechanism isn’t as good as a standard recliner chair – sometimes makes a squeaky noise. The high back design with deep seat makes this Davinci’s Olive Glider one of the best nursery gliders for parents in tall stature. 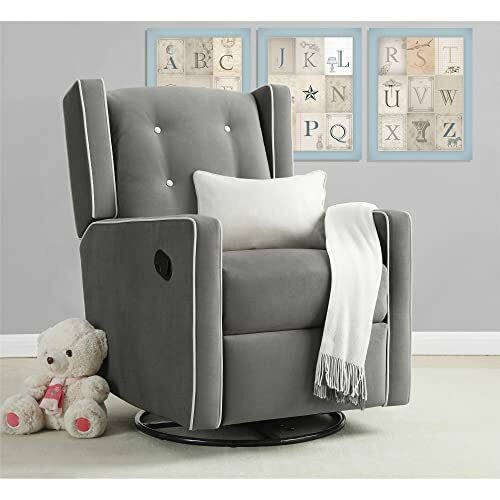 With its simple and stylish look paired with a smooth gliding motion and gentle 360-degree swivel, this chair will quickly become a favorite in your baby nursery room, or any room of your house. Comfortably built with both mom and baby in mind, this nursery glider is made of soft and durable 100% polyester fabric with high-quality metal base. It includes a stationary upholstered ottoman and lumbar pillow for added comfort. If you’re looking for a nice-looking modern nursery glider for the living room, look no further than the Dutailier Urban California Glider – where quality and comfort meet design! Featuring Dutailier’s exclusive gliding system with top quality sealed ball bearing that creates effortless flow and supremely quiet gliding motion, paired with its spacious and comfortable seating area so you don’t miss a thing, this glider is a dream come true. But those aren’t the only part of the Urban California Glider that have been given a lift. Using clean lines and a narrow profile that still offers ample room for sitting, this glider has a modern appeal that works in any contemporary decor, whether that be in a guest room, master bedroom, great room, or even a child’s nursery. 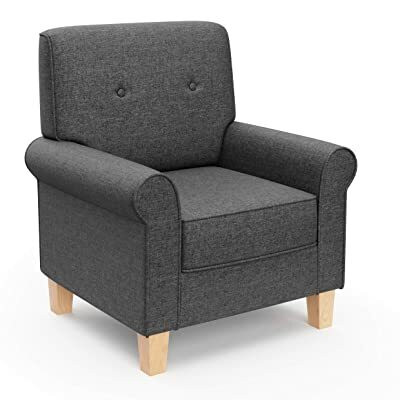 The quality construction of this chair boasts a finely crafted laminated birch wood frame and 100% polyester fabric cushions set on top of an elastic membrane in the seat and back for supremely soft comfort that will last. The Dutailier Urban California Glider is definitely the best nursery glider for those looking for a simple and modern glider with the smoothest gliding motion. You can also add more comfort to this chair by matching it with the Urban California Sliding Ottoman, which is sold seperately. Ottoman sold separately. It glides.